Guess who’s Going for Gold??? The happiest person on the field today must be Oliver Townend and we figure Imperial Master deserves as many Polo Mints as he can eat! The duo have taken an impressive 11 point lead after day one in the CCI3* class, with a lovely dressage test, scoring 39.8. In joint second place are Joseph Murphy (IRL), with Sportsfield Othello and Christina Wiederkehr (GBR), with Cruise GTI, on 50.8. Sarah Ennis (IRL) is on 53.0 with Horseware Malachi in 4th place, followed by Izzy Taylor (GBR) on 53.2 with Thisteldown Poposki. Oliver Townend is 6th overnight on his second ride, ODT Ghareeb, who scored 53.4. In the CCI2* class, less than 4 penalties separate the top three, so this is one to watch! Jodie O’Keeffe (IRL) is in the lead with a score of 37.2, on Kachemire Le Beau and Sam Watson (IRL), is right behind her with Imperial Sky on 38.2. Angus Smales (GBR) is lying 3rd overnight on 40.4 with MJI Mount Echo. 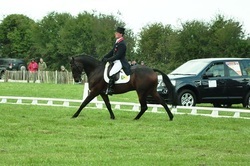 What a great start and more great dressage to look forward to tomorrow. You know where to be on Saturday (only two more sleeps!) …..watching cross country at Ballindenisk, with Goresbridge Go for Gold!